Welcome to the Erlangen Valency Patternbank! 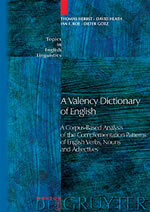 The patterns are based on the Valency Dictionary of English by Thomas Herbst, David Heath, Ian Roe and Dieter Götz (2004; Berlin/New York: Mouton de Gruyter). You can start straight away by using the navigation on the left-hand side. There is a three-minute guided tour for some basic information. For detailed background information (including corpus basis, theoretical framework, references, …) take a look at our our introductory text. If you read German, you can also take a look at Anatol Stefanowitsch's Festvortrag zur Eröffnung der Patternbank.